These delicious quesadillas can be a great way to use up good leftover protein and are quick to prepare. Pork in this recipe could easily be swapped for leftover beef or chicken. Spread KNORR Mexican Chunky Salsa Mild over half the tortillas. Top with pulled pork and cheese, then place remaining tortillas over the filling. Heat a flat grill plate or large frying pan and spray with cooking oil spray. Cook the quesadillas, turning over gently, until golden and slightly crisp. Remove from heat and cut each one into six pieces. 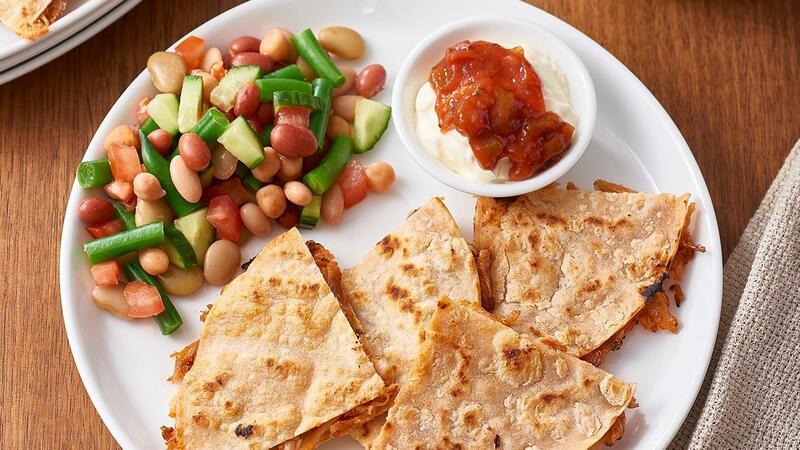 Serve quesadillas with simple fresh salsa style salad, sour cream and extra KNORR Mexican Chunky Salsa Mild.